Traditionally, urban "green spaces" such as meadows, wooded areas and other natural areas were found only in parks, but more recently urban green spaces include urban forestry. The ability to experience green spaces in Urban Landscapes is useful for promoting physical and emotional health and general well-being. Urban green space provides relief from the hardscape that is prevalent in urban environments, and offers opportunities for both passive and active recreation. The provision of urban green spaces has become an essential element of public health policy. This tool examines the process of establishing, expanding and improving urban public parks, forests and recreation facilities. Open Space: Access to open space, the enjoyment of natural surroundings and access to a wide variety of recreation opportunities can be achieved through this tool. Energy Conservation: Establishing recreation facilities in urban landscapes allows residents close and easy access to the facilities they need, which saves the costs and energy of travelling to remote locations. Access to Recreational Opportunities: The enjoyment of natural surroundings and access to a wide variety of recreation opportunities is sometimes called "Green Recreation". Cost Effectiveness: Beyond the positive sociological impacts on residents, urban parks have a much lower annual cost per unit area than developed land. While annual park maintenance does require a budget, it is much lower than providing street maintenance, water and sewer service, etc., for residential, commercial or industrial uses. While parks do not generate tax revenue, some municipalities offset park costs by renting certain park facilities for group events. Environmental Benefits: Urban green areas and forests offer positive attributes which include improving air quality, relieving urban heat island effects, reducing stormwater volume and providing habitat for wildlife. Urban forests can used as windbreaks, steep slope stabilization and erosion reduction, stormwater runoff infiltration, and as buffers between dissimilar uses. Increased Property Value: Proximity to wooded areas has also been shown to increase property value. Economic Development: Establishing quality recreation facilities in an urban location can attract customers from the surrounding area, which can spur economic development in urban centers. Funding: The primary limitation to establishing these facilities in an urban location is funding. Private investment in urban recreation facilities has a greater potential for realization than urban forests and parks that are more often funded by the local municipality. The current economic environment has municipal governments struggling to maintain their level of service to the community, so funding for these facilities and even funding for grant matching has been difficult. Ongoing Maintenance: When trees in natural areas become diseased or die, they can rot and fall, thus providing habitat for animals that live in such environments. However, urban trees must be maintained to avoid falling or dropping limbs. The High Line, located on Manhattan's West Side, NYC. An urban municipality that is interested in establishing parks, forests and recreation facilities should revise its future land use map in its comprehensive plan to identify areas where these uses would be located. This might include the creation of a new category on the future land use map or a text revision to add these uses to the existing appropriate use category. The municipality should also consider creating an official map that identifies parcels and corridors that could accommodate the establishment of parks, urban forests and recreation facilities. The municipality should then review its zoning ordinance to add these uses to the applicable zoning district or create a new zoning district that would specifically accommodate these uses. Municipal policy makers should be flexible regarding the location of urban green features. These elements can involve use of abandoned industrial sites and river or stream corridors as well as unused transportation facilities and infrastructure. A notable example of a transportation facility that was converted into an urban green space is the High Line on New York City's west side, which converted an unused elevated railway into a linear greenway and park. 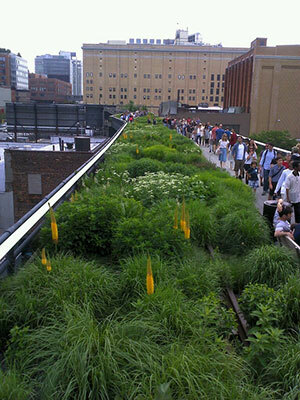 Since its opening in 2009, The High Line attracted over two million visitors and is expected to generate economic benefits for the surrounding neighborhoods. The municipality should also specifically permit a range of appropriate active and passive recreational activities in the urban park and forest area. By encouraging a variety of activities, public safety can be enhanced and a wide range of recreational needs can be met. Additional support facilities may also be needed, such as water fountains or shops and restaurant that meet the needs of the park's users. Parks, recreation facilities and urban forests could be combined on a single former industrial site or form nodes in urban trail networks. Urban forests could be combined with a trail network along river and stream corridors. This would help stabilize steep banks, improve water quality by shading the river or stream for fresh water fish species, provide shade for the trail users while improving the scenery, suppressing noise, improving air quality and serving as a buffer between different areas of the city. Traditionally in the Urban Landscape, land for parks and recreation was in low supply and often expensive to acquire. More recently, the availability of land and acquisition price has become more attractive to municipalities and non-profit groups, due in part to changes in the country's industrial base, with large urban locations for industries such as the steel industry becoming available for redevelopment. This is the case for the City of Coatesville and Phoenixville Borough. Both Coatesville and Phoenixville are redeveloping former foundries and steel mills. While such brownfields can include negative aspects related to their previous uses, they can be extensive in area and are comparatively flat. 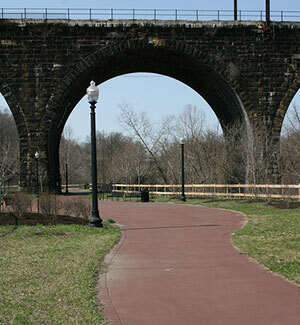 The Riverwalk in the City of Coatesville is a trail that begins at a former steel mill site on Route 30 and continues north along the Brandywine River. The trail will accommodate pedestrians and bicyclists. In the Borough of Phoenixville, the Strategic Plan for the French Creek Corridor and Downtown Business District describes three trail sections that traverse the former steel mill site along both sides of the French Creek. These trail sections will link up with surrounding regional trail networks. The protection of natural resources is a required component of a municipal or multi-municipal comprehensive plan that is authorized in the Pennsylvania Municipalities Planning Code (MPC). Section 301. (a)(6) states that the comprehensive plan shall contain a plan for the protection of natural resources including, but, not limited to, wetlands and aquifer recharge zones, woodlands, steep slopes, prime agricultural land, floodplains, and unique natural areas. These areas can also be found in urban landscapes. The Pennsylvania Municipalities Planning Code can be accessed online.